With its graceful, arching set of leaflets, this gorgeous plant is also known as an Umbrella Plant. Give this and even a rainy day will seem bright. Container may vary from photo. A whisper-quiet affirmation of love. Subtle shadings of pink and white roses, lilies and other delicate seasonal flowers in a simple, elegant vase. When only the best will do for Mother's Day, surprise her with this incredible gift! Our choice of bold colors make this arrangement stand out from the others. 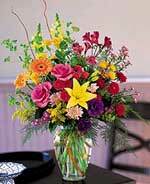 A classic everyday vase arrangement with brilliant cheery blooms is a lovely way to show you care for any reason. Our designers use only the freshest flowers so colors and varieties may vary.